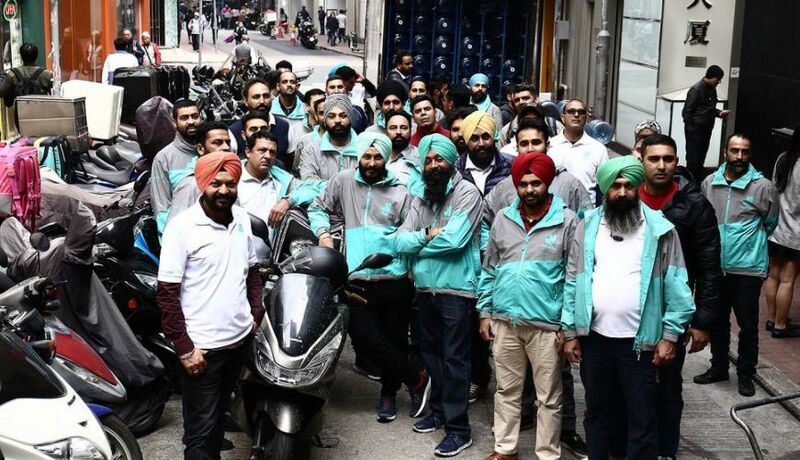 On Monday evening, January 22nd, up to 100 riders of Deliveroo HK, mostly Indian and Pakistani, gathered in front of the offices of the company in Jervois Street blocking the food delivery service. The strike was triggered by the recent changes made by the company in the work schedules of the deliverers, that right up until then guaranteed 11 work hours paid at least 75 HK $ (around 7,8 €), including a one-hour lunch break. Now Deliveroo has decided to block the delivery app during non-peak hours (when there is low activity), in order to avoid paying to the workers the guaranteed minimum. Moreover, the new system would be able to select riders based on their performances (frequency, speed, respect for the standards imposed by the platform, etc. ), punishing the less “efficient”. Platform disconnection, imposed by the company, would cause to the riders a loss of approximately 3 to 5 working hours, nearly 14 hours a week. At a degree of 100 HK $ / h (nearly 10,5 €), in terms of monthly income the reduction of the salary is estimated to be between 5.000 HK $ (521 €) and 6.000 HK $ (625 €). Among the reasons for the protest, there is also that of compensation by the company for the traffic tickets. In order to comply with the terms of the delivery in the narrow streets of Hong Kong, most of the riders are forced to park their means of transportation in non-authorized parking spots and the police do not hesitate to fine them. Riders were reimbursed up to two tickets a day by Deliveroo, but now the company refuses to do so. This is in addition to gasoline and maintenance of the vehicle remains at the worker’s expense. The strike, that continued until the next day, ended when the management announced the restoration of the 11 hour work day. During the last weekend the Deliveroo deliverers from Belgium and the Netherlands went on strike to protest the company’s decision to turn all riders, from February 1th, into self-employed workers. In Brussels, the workers occupied the company headquarters for more than 3 days calling, on social media, sympathizers, precarious workers and unemployed to support their struggle, which they claim to be everyone’s. While the occupation was underway, Minister of Economy and Employment, Kris Peeters, and the CEO of Deliveroo stated that they were willing to meet the riders to hear their demands. Even though the company showed to be in favour of some compromise, the deliverers decided that the pressure should be kept high. Yesterday, on January 27th, a delegation of Dutch Deliveroo strikers joined their Belgian colleagues in downtown Brussels to create a lively protest with an internationalist profile. Messages of solidarity were sent to the Belgian comrades from riders from MIlan, Turin and Bologna. Even the UNI Global Union, the international federation that brings together the unions of the service industry, sent a message of support to the “Deliveroo workers on strike in Belgium and the Netherlands”. In Lille, France, the protest sparked on January 20th, when the Uber Eats riders decided to disconnect themselves from the company’s app. The strike, spontaneous, organized through a group on Facebook, struck against working conditions described as “slavery 2.0”. Lastly, Germany’s turn was on January 24: up to thirty riders from Foodora and Deliveroo protested in front of Deliveroo headquarters to demand, among other things, the payment for the repair of the bikes used during work-hours. In this report of the rider’s struggles we surely have missed some strikes and blockades (by the way, in Shanghai, China, the first online food deliverers union has been formed), but we are sure of one thing: the need for a coordination of the international struggle of the workers of the “gig-economy” is the business at hand. And the means to set up networks are not missing. Translated from the original article in Italian on the Chicago86 website. They work for a delivery app called Loggi - a brazilian startup whose main investor is a Uber CEO. Could I use this for the Surrey and Hampshire Anarchist Federation blog?